The most legendary Barbarian of all time is back. 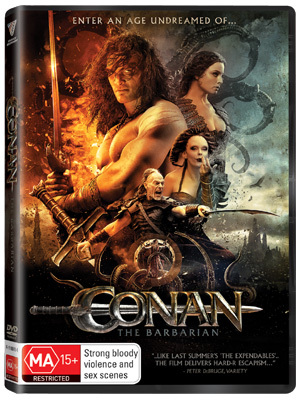 Having thrived and evolved for eight consecutive decades in the public imagination, Conan's exploits in the Hyborian Age now come alive like never before in this colossal action-adventure blockbuster. Adapted from the legendary original works of Robert E. Howard, directed by Marcus Nispel (The Texas Chainsaw Massacre, Friday the 13th) and starring former Baywatch star Jason Momoa (TV's Game of Thrones) and Ron Perlman (Hellboy) Conan The Barabrian is a giant entertainment about a tough, calm hero with no allegiances and the ability to overcome all opponents with his brute strength and a seasoned warrior's skill!